Last year was a year of transition as personnel changed in many key positions as well as Subject Matter Expert (SME) areas. However, the JAPCC continued to develop and refine its external as well as internal plans, processes, and activities. We conducted a variety of activities that directly support the three lines of operations identified in the ‘JAPCC Comprehensive Plan’. First, JAPCC supported NATO Operations in Afghanistan, participated and led NATO working groups and other forums. Second we executed projects at the request of the Sponsoring Nations (SNs), Allied Command Transformation, Allied Command Operations, and other external agencies as we had capacity. Finally, JAPCC continued efforts to make the organisation better with our internal improvement campaign. The JAPCC relies upon key strategic guid­­ance to maintain its relevance and build­ing on the success of last year’s inaugural Executive Working Group (EWG) meeting, JAPCC’s second EWG guaranteed the Centre remain connected to its SNs. Past, present and future projects were presented to the Nations, and in turn, the JAPCC gained important direction and ideas from our SNs. This second meeting was a major success, and I eagerly anticipate hosting the next annual EWG. Many of JAPCC’s achievements during 2011 are included in this report but I would like to summarise a few of our ­accomplishments here. Again this year, JAPCC actively supported operations in Afghanistan. Our SMEs led the development of new Force Protection (FP) doctrine which was published as STANAG 7217, entitled ATP-3.3.6 ‘NATO Force Protection Doctrine for Air Operations’. This work’s value was underlined during a six-month deployment to Afghanistan by the JAPCC FP SME, during which his application of the draft FP doctrine ­allowed 10 nations to combine their ­capabilities in addressing a hitherto intractable force generation challenge, providing International Security Assistance Force (ISAF) with a robust and ­effective FP capability in an extremely demanding operational environment. In April of 2011, the JAPCC delivered the Regional Fighter Partnership project report. This project focused on implementation of a fighter consortium concept for nations looking to recapitalise their fighter fleets at reduced oper­ations and maintenance costs. The Air-Land Integ­ration Project was completed in September 2011 with the publication of the Air-Land Integration Operational Assessment. Air & Space Support to Counter-Piracy off the Horn of Africa was another noteworthy project that highlighted a very successful cooperation with an industry partner, the Boeing Portal. The Boeing Portal provided significant assistance with modelling and simulation and delivered valuable information informing this study. The resulting publication will be released early in 2012. Following a request from Air Command Izmir, JAPCC deployed two offi­cers to assist the Air Component identify key les­sons for Operation UNIFIED PROTECTOR. This effort produced a ­report detailing 47 findings which are key inputs to Lessons Identified/Learned for OUP. Our C4ISTAR Branch authored the NATO Joint Intelligence Surveillance and Reconnaissance (JISR) Step 1 Concept of Operations (CONOP) for ISAF. Completed within 3 months of the initial request, this CONOP is now used by ISAF as the overarching document guiding JISR Standard Operating Procedures as well as Tactics, Techniques and Procedures. Our annual conference with the theme: ‘Understanding Air Power – A Joint ­Appraisal’ provided a forum to discuss ­issues and we considered how current difficulties, future challenges, strategic options, operational requirements, tactical consequences, and realistic, achievable solutions might evolve. The conference was attended by 250 participants, amongst them 60 flag officers. As can be seen from this brief overview, 2011 was a productive year for JAPCC. 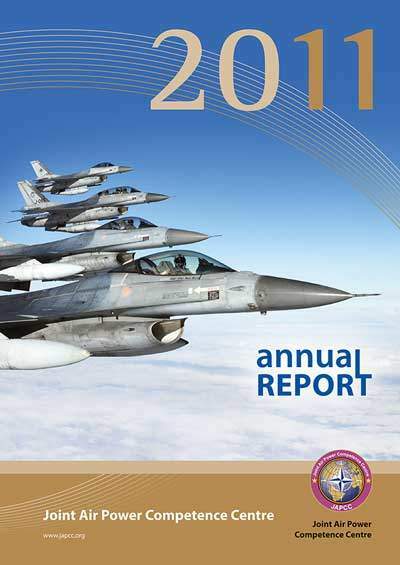 2012 will no doubt be a year of challenges and opportunities as JAPCC con­tinues its effort to ensure we remain relevant; leading the way as a catalyst for the transformation of NATO Joint Air & Space Power.